It's time we have a frank discussion about seedless watermelon. Some of you might think I'm being dated. After all, we already celebrated Labor Day and there are no more white shoes to spill our watermelon juices on. What's the point? Why bring it up? The past is the past. "Time to move on." I challenge that sentiment. Some of us live in God's crockpot (Texas), and that means the watermelon still flows like milk and honey. If we don't talk about it now, when will we? I've always been in the camp that seedless watermelon is the plastic surgery of fruit and I never wanted anything to do with it. If you want it, GREAT! But I was happy with the seeds. They were natural. They were the crows feet and gray hair that comes with wisdom. If grandmas shouldn't have baby faces, why should my watermelon? Plus, the seeds are the only way I can tell watermelon apart from their doppelgänger, smoked salmon. It's almost impossible to find our wholesome friends without having been genetically modified. Time and time again this summer I've settled and sold out on science. Each time cutting my losses, but still thanking the soil for growing my mouth party anyway. You know what, though? For every watermelon I've begrudgingly purchased sans-seeds, there has been one that's gotten away. I'm surprised by how often I'm greeted by the hundreds (?) of tiny black smiles when I slice open said watermelon. I don't know if you guys are super mutants or if you simply got thrown into the wrong bin. 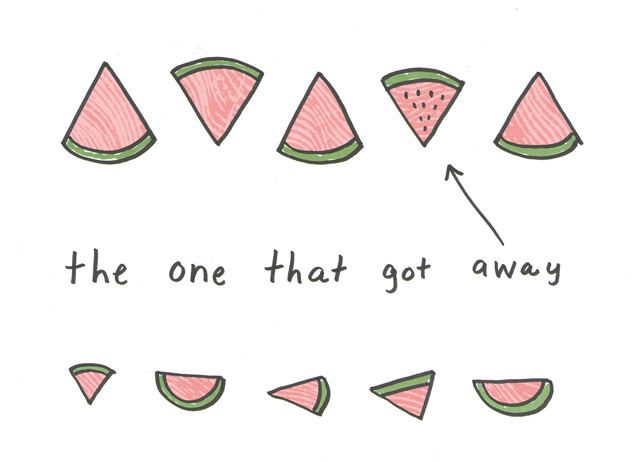 But this post is for you, Mr. Seeded Watermelon Amidst The Seedless. You are true warriors and we applaud your courage. SIDE NOTE: watermelon banana smoothies are a treat! I suggest you make one today.